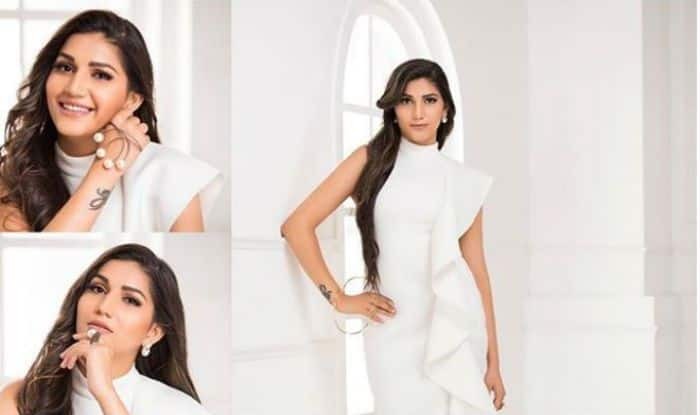 Sapna Choudhary's makeover can shock you. Haryanvi singer and dancer Sapna Choudhary is gradually becoming a part of the glamour industry. She surely knows how to make our heads turn with her latest pictures on Instagram. Recently, the bombshell shared a few beautiful pictures of hers where she has undergone a makeover. She has transformed into a new avatar after reducing oodles of weight. The actress was seen in the Bigg Boss 11 house, she was applauded for her straightforwardness and her dancing skills as well. When it comes to flaunting her curves, Sapna really knows how to do it. The Anarkali of Haryana, who was earlier seen in simple yet traditional dresses, seems to have gone the modern way. Sapna captions the picture as, “kill tension before tension kills you #happytime #mastii #desiqueen.” She looks uber hot in all white ensemble. Her glam quotient is making everyone’s heart beat faster. She has accessorised her look with pearl earrings, a big finger ring and a classy pearl bracelet. The kohled eyes, pink lips and perfect makeup are giving an edge to her look. Sapna was lately seen in many music videos. Chori 96 and Superstar became big hits and Ram Ki Su, Billori Akh also garnered love on social media. The Haryanvi diva is all set for her Bollywood debut, Dosti Ke Side Effects. In Bigg Boss, she was praised for her straightforward nature and bindaas attitude. She did well in the task and was considered as one of the toughest contestants. She has also featured in Bollywood songs like Tere Thumke Sapna Choudharyfrom Nanu Ki Jaanu and Hatt Ja Tau in Pulkit Samrat starrer Veerey Ki Wedding.